Niche line Bond no. 9 will launch New York Nights, a new gourmand fragrance for women, in September. This after-dark skyline was the inspiration for New York Nights, the eau de parfum, which infiltrates the air with similar elation. A broad-spectrum female urban gourmand. it perfectly captures the undulating glow of New York’s after-dark skyline glow. Its topnotes are unabashedly romantic and floral–jasmine, gardenia and carnation. Then come the warm, seductive heart notes– patchouli and sandalwood, enlivened with a clean floral marine accord. And with the lingering base comes the kicker: coffee infused with caramel, racing the heart and punctuating the New York night. So beautifully structured is this scent that minutes later it leaves in its wake an unexpectedly intriguing creamy-floral trail that’s as light as air. Both sides of the New York Nights bottle display a stylized adaptation of the city after dark. Against a gleaming late-night royal blue background, with a lowering cloud passing by, a multitude of stylized skyscrapers and spires glimmer in boxed-in otherworldly pink, red, green, buttercup yellow, cerulean blue, and gold. Think colorful confetti. Think shimmering New York nightlife. Where else in the world would you want to be? Bond no. 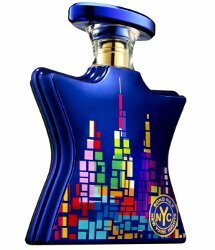 9 New York Nights will be available in 50 and 100 ml Eau de Parfum. Color me curious. The floral-meets-marine-meets- gourmand take makes me think of Maurice Roucel’s Missoni, with caramel and coffee replacing the chocolate. Kind of over the cafe trend but excited to see where Bond takes it. That 1st inhale of coffee-infused air when you step inside a Starbucks is one of my favorite pleasures on earth. But, I generally don’t want to smell of coffee and caramel. Maybe NY Nights’ floral-marine accords will balance and transform the gourmand elements into sheer layers instead of smothering blankets. That “broad-spectrum urban gourmand” description makes me smile. They have the seductive night out represented by the jasmine, gardenia, and carnation; the marine accord for what folks do when they return home from a night out… or, you know, whatever. Then it concludes with the morning after latte at Starbucks; coffee and caramel. Sounds like a good time to me! Wha?? It sounds so wacky with no context. So great. I am going to use that in real life. Nobody can beat the “women are polyhedral” comment (already forgotten the brand though) but it’s pretty darned good. Haha, this is my first time hearing that one! I was just thinking I would love it in some other colors — those just aren’t my colors. But I don’t think it’s tacky. The colours, plus that mosaic-like pattern makes me think more of Barcelona and Gaudi than an evening skyline of New York. Coffee and caramel? Try By Kilian Black Phantom! The bottle would look more NY at night if each building was stylized in monochrome; I will even allow an ombré contrast and a different color for each building. This looks like Times Square run amok. The idea of a marine accord of any kind being combined with the rest of those notes makes me queasy. Tested a little lab pump at a Bond counter. I am completely captivated! Yes, there is a gourmand attitude but it is subtle and does not overpower the floral blend. This is a superb feminine floral and to me there is no marine – I don’t detect anything at all that interferes with the florals. Best feminine Bond since Chinatown and I have always considered Chinatown to be the Bond masterpiece. I could not stop smelling my wrist! And isn’t that always our own personal benchmark for buying? And I love the bottle! All the colors seem to depict all of the different facets of NY nightlife!